On Monday, reports arose that Coinbase, the world-renowned crypto startup, had quietly launched a product to its already-extensive roster. The service is found under the “International” redirect on the firm’s website, and, for some reason, wasn’t exactly publicly announced. This service, which touts itself as allowing for users to “send money internationally for free,” will be utilizing USDC, a stablecoin launched by CENTRE partners Coinbase and Circle, and XRP, added mere weeks ago after months of hype. And yes, this doesn’t seem to be an April Fools’ joke. This will allow users to send the aforementioned digital assets “across borders virtually instantly” to Coinbase-supported nations, which can then be converted into the local currency. Although this sounds a lot like blockchain-enabled remittances, the firm has made it clear that this isn’t exactly the case. Coinbase International processes transactions for free, as the company will be sending crypto ledger transfers within its own books, rather than on-chain. As to why this product exists, a firm representative told CoinDesk that International is “primarily designed” to be an “education resources” for consumers to learn about the benefits of using digital currencies, whether it be Bitcoin, XRP, or otherwise, in cross-border payments. Interestingly, Coinbase’s decision to stick with the Ripple-tied XRP and USDC cryptocurrencies comes as another slap in the face of Bitcoin proponents, many of which already have a certain distaste for the mentioned exchange. The firm may have done this for a logical reason though. 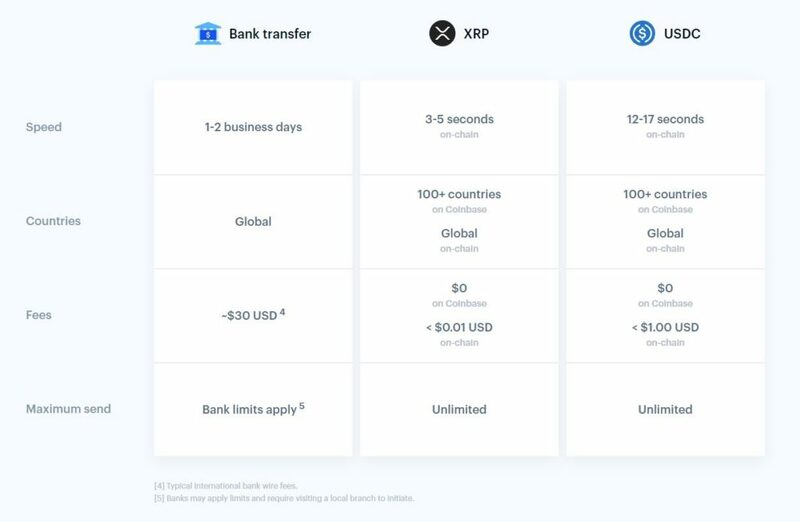 As a graphic (seen below) explains, XRP transactions take three to five seconds to process on its ledger and cost under a sent. Much of the same is seen with USDC, with the Ethereum-based token taking ~15 seconds to send with a sub-$1 fee. On the other hand, classic bank transfers can often take upwards of 24 hours, and cost upwards of $30. Ouch. While the product’s premise is entirely logical, some took issue with the choice of cryptocurrency. Larry Cermak, an analyst and journalist at The Block, recently took to Twitter to express his disgust towards Coinbase, making it clear that International doesn’t really make sense. He asks why Coinbase didn’t add Bitcoin, Ethereum, or any of the other cryptocurrencies it recently added in rapid succession. He explains that XRP’s speed isn’t a solid answer to this question, remarking that ten minutes or ten seconds doesn’t matter for remittances, which seems to be the audience Coinbase is trying to target. Moreover, he explains that the addition of Bitcoin is only logical, as it does have the largest network effect and the most amount of infrastructure, especially fiat off-ramps. The company has yet to announce this product, meaning that it does have the chance to respond to this criticism when it finally goes fully public with International.